There are three Youtube videos of the 2 hour session. Fear not. You can skim the video using our handy subject matter guide to the video which includes time stamps to selectively view snippets in the video. 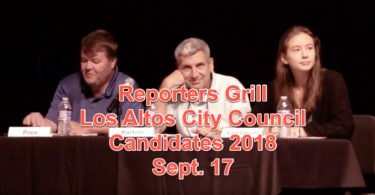 If you only have time for one and want to hear BCS board member opinion, look at Part 3 on Youtube. If you want to hear LASD Trustee answers, look at Part 2 on Youtube. In Part 1 on Youtube you can hear 8 public speakers, including John Radford, former LASD trustee Tamara Logan, and LASD volunteer Sharon Clay. If you leave this post and view directly on Youtube, be sure to tap on CLICK MORE to see the timed links. If you just want to read, and not take the time to view and listen, then just read the ‘nuggets’ about the Kohls 10th site and my timed listening notes below. 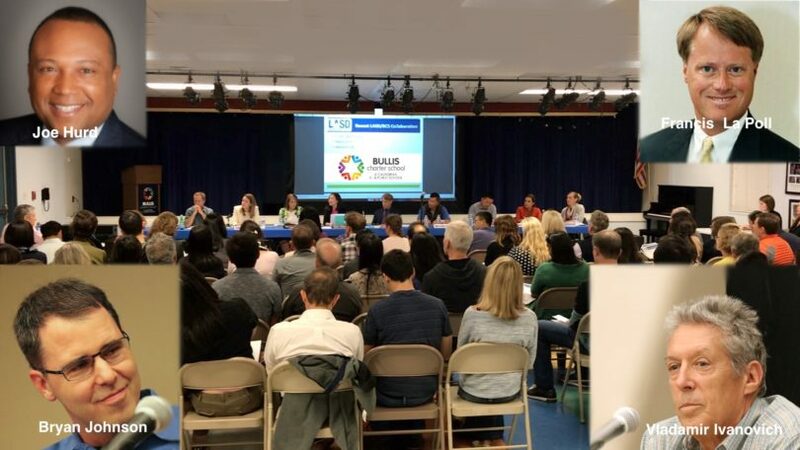 John Radford, one of the founders of the Bullis Charter School is frustrated with the lack of progress on using Measure N money. He blames both boards and laments a ‘hardening’ of positions. The Kohls 10th site deal details like final cost might be released as soon as Oct. 8 at the regular LASD Trustee meeting. The TDRs transactions will close sooner than you think. Virtually all LASD Trustee and staff deciding, studying and planning about the Kohls 10th site will occur AFTER the purchase closes. The 10th site Task Force was “not allowed” to consider alternative solutions to Kohls 10th site such as using existing capacity. LASD is 500 students SHORT of what it forecast for 2018-2019 in the 5-year agreement. Meanwhile, BCS MET its forecast of growth to 900 students for 2018-2019 per the 5-year agreement. There is empty building capacity [rooms, interior space] and portables at Oak, Loyola, Springer and Blach schools. 13:20 Bryan Johnson. We have not finalized the decision on what students should be on the Kohls 10th site. On what school design might be there. It might be a multi-step process over the next several years. 23:25 Speaker Five – Tamara Logan. I am shocked by the amount of effort being expended to stop the acquisition of new land at the Kohls 10th site. Yes, our growth is flat [if you include the growth of the charter]. I was here when the 1998 board made the mistake of closing someone else’s school. [There was no board member from Bullis-Purissima school that year]. I can tell you about a board member who was a proponent of closing schools. Later his son was bullied about it in junior high. 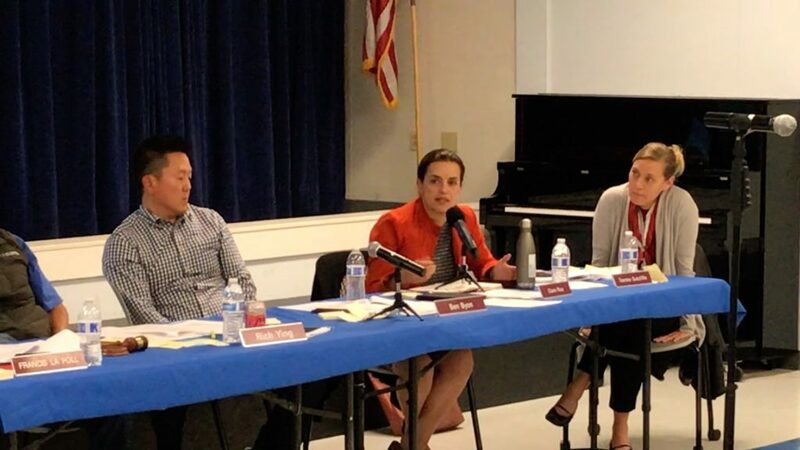 [Lalahpolitico: This incident dates to the earlier closure of Portola School and the lease of Eastwood in the 1980’s. It is not related to the 1998 closures. ] It would be bad to lose the community peace we have had in the past 4 years with the “5-year agreement.” This new land is a facility for BCS. Former LASD Trustee Tamara Logan likes the Kohls site for BCS. She has always hoped to find a site in MV for them. She implores the Charter to ask the County Board of Education to allow them a preference for low SES students. She has been asking for this for years and years. 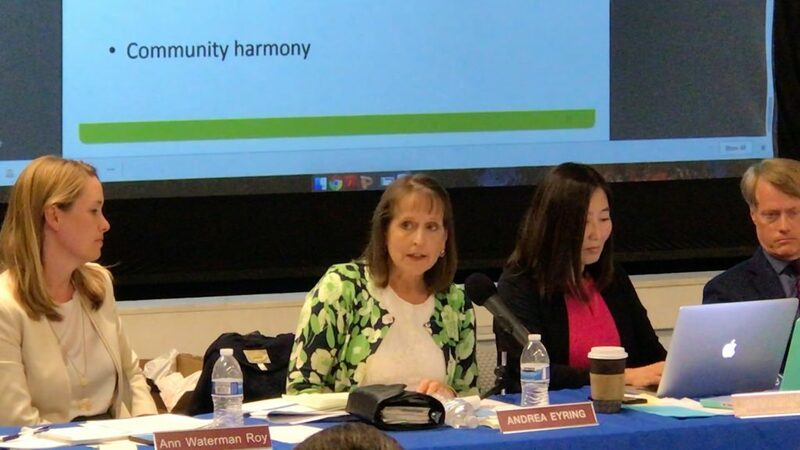 Lalahpolitico: The current LASD Trustees made a big mistake bringing her and former Trustee Doug Smith to the formal BCS-LASD negotiation table. Sad. – And stop calling us low-income people. We are not. Yes, there are a few in the greater North of El Camino Area. BCS Board members took turns asking the LASD trustees questions. 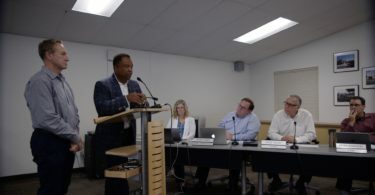 The BCS board members took their turn from the left end of the table to the right end as you view it in the video. Both LASD’s Bryan Johnson and Vladamir Ivanovich gave answers. 00:30 – First BCS Board Member. David Jacques. How willing a selling was Federal? What is the portability of these TDRs? There is little precedent for this. ANSWER: VI: this info is not in the public domain. BJ: We sold all the square footage. We have strong backup interest in purchase. 3:10 – Second speaker. Anne Waterman Roy. What is your enrollment growth this year? It looks like you have space capacity now? But you say there might be a spike up in the future? What data analysis do you have? If enrollment declined 500 students over the past 5 years why not put any future spike in the District’s current empty spots? ANSWER: BJ: There are 1600 units approved. Even at 1/10 a kid per unit that will generate several hundred kids. Also the north end schools – Santa Rita, Almond are all FULL. [Lalahpolitico: The district has been redefining capacity. 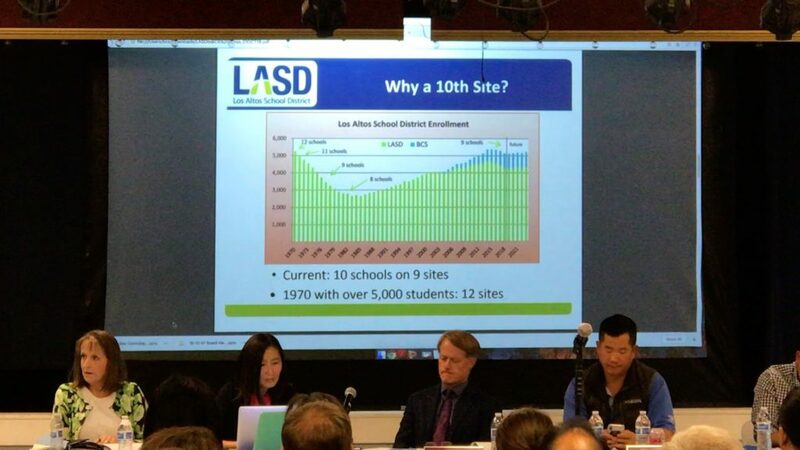 Full used to mean <700, then <600 and now between 300-500 feels full to LASD…moving the goal posts. Not a single school including the junior highs is close to 700 today Oct. 6, 2018] BJ continued..yes there are other solutions, but it will better if we have the flexibility of a campus at Kohls 10th site long-term. We want more flexibility long-term. 09:00 VI: You are ignoring the 900 students at BCS. With that, enrollment is flat. 09:45 If the Kohls 10th site deal fell through, are there other solutions? ANSWER: BJ: Yes, we looked at those at the Sept. 27 board meeting. But this Kohls 10th site is the best solution for all people, especially NEC. It adds 4 acres of open space at a school to the NEC area. 11:40You say Kohls is the best option. Which other options were considered? ANSWER: For example we looked at putting two schools on Covington. That means tearing down the old school and building two new schools, not just one new school like with the 10th site solution. As with a house, extensive remodeling is not cheaper than tearing down and building new. 13:35 Andrea Eyring. Can you explain more about the 11.5 acres at the Kohls 10th site being sold by Federal Realty. What is the use of the Greystar purchased 2 acres? ANSWER: It is a 24/7days a week city park. There is no use for the school’s programs. 14:00 Eyring: In other words, the Kohls 10th site is a 9.5 acre school site. What made you think that was enough for a large enrollment school? 15:15 Eyring: [But that is 3 grades, and they have a common shareable facility need. We are k-8. Lower grades need specialized outdoor and indoor areas.] What is the time frame for an analysis of how many students in various grade configurations could be accommodated there? ANSWER: BJ: You should help drive that in conversation with us and you. You tell us if you are interested in all or some of the Kohls 10th site…short-term…long-term. 16:15 Eyring: You say Santa Rita and Almond are Full, even the portables? You could replace those with Measure N. What is the capacity of just the buildings? ANSWER BJ: I can get you that number. 17:05 Eyring: Why is there just a demographer’s presentation and no full report this year? ANSWER VI: We switched to a 2-year update cycle. 17:45 Eyring: Can you tell us what the enrollment is this fall? ANSWER: I don’t know it. ANSWER: BJ: Using existing land means tearing down most of an old school and building 2 campus. Plus it is very disruptive to tear down the old school. 19:30 Eyring: What is the Importance of a neighborhood school in the NEC area? ANSWER: BJ Actually the most important thing is the “educational outcomes” for the NEC residing students. Parents there are very satisfied with their current schools [ Lalahpolitico: implies the NEC parents are satisfied with going to either Santa Rita, Covington, or Almond. Elides the question?] Students are not widgets to move around. A school community should not be moved. ANSWER: VI – I didn’t say that. BJ: Let’s not conflate a permanent facility for BCS with the Kohls 10th site. VI: I can tell you that at least one LASD board member does not want to put BCS there. 23:15 Rich Ying – Have you considered the TDR risk factors? 25:30 Do you have a back-up plan…you could be buying at the top of the market…and then get caught in a fall? 27:00 After you close on the site how long till you design the school and open the school? ANSWER: The first thing is a CEQA process. [California Environment Quality Assurance act] That would take 12 months. Construction would be at least 12 months. This is a multi-year process. 28:15 Next Board Member – Let’s get back to the EIR – Environmental Impact Report. Have you identified the gating factors? ANSWER: VI – We have started a CEQA process. We have done them in the past, and we don’t think it’s going to be an issue. 29:35 You say planning for a school is premature now. But I worry that you are not going to design to a budget; but are going to be trying to find a budget for an unknown design. You are saying you are going to rightsize the design only AFTER you acquire the site. 30:45 When will the TDRs materialize to finalize a construction budget? ANSWER BJ: It won’t be long. 31:50: Some of the key themes on the Thought Exchange online discussion board were Safety and Transportation. Have you considered how to mitigate the issue of traffic at the Kohl’s 10th site? ANSWER: BJ: no we can’t decide that till after we decide who is housed there. 32:40 The pedestrian and bike access and safety is rather poor in the area. Sidewalks are quite narrow. DID YOU DO A TRAFFIC STUDY or a traffic discussion? How will you address the issues around the Kohls 10th site? 34:50 With respect to maximizing current resources, If the deal does not close what would the back-up plan be? ANSWER: If you see our Sept. 24 LASD trustee meeting we looked at some options there. You can see those in the presentation. We have nothing detailed about those. For example, if you – BCS – are planning enrollment expansion, we should have to take that into account when considering backup alternatives to the 10th site. 36:20 How much new housing are you assuming in NEC? ANSWER: Well, 1600 unit have been approved by the city. That does not mean a shovel in the ground. Greystar at the old Safeway is approved for 600, the old Dittmer’s site is more than 600; there are 400 units going in behind the Target store. 38:00 With more units and more traffic how can you not prioritize a neighborhood school on the Kohls 10th site? ANSWER: BJ: The need is not there immediately for that. The capacity will be there 20 and 30 years from now. Two points. A permanent home for BCS is a high priority. Its attendance may change over time. Therefore the use of the 10th site might change over a longer time. 40:10 Ms. Roa: If BCS is there, what shall we do with NEC kids? 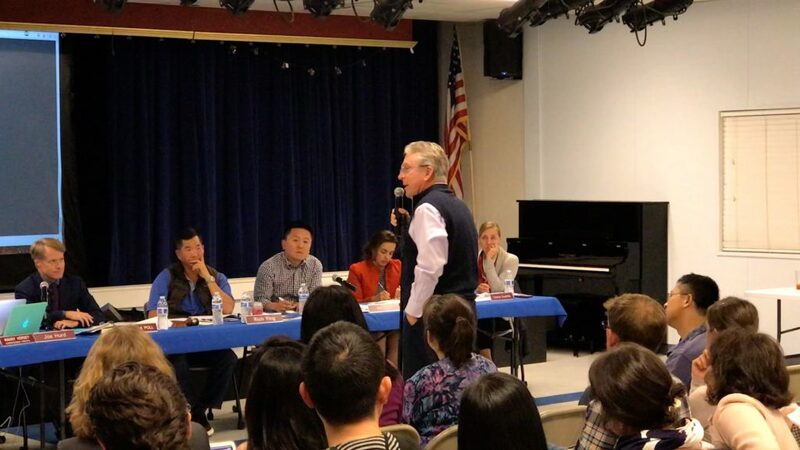 Why was this Del Medio Park forum with NEC residents and families held only last week? Weren’t they being considered? ANSWER BJ: This was not the first time we talked to NEC folks. So BCS may be placed at the Kohls 10th site? Are there projections of NEC student enrollments to fill a neighborhood school? So BCS being there might not be permanent, but just till NEC grows? 44:00 How can BCS be included in the design of a school there? VI: We will consult with you about your needs an interests. We would not put you in a 17-story building. 45:25 What would the short-term plans be for BCS till this school opens in 2022? 1) explain again how come the 10th site is 9.5 not 11.5 acres. How many acres are for building and parking (5) vs. open space(4)? 4) About the 10th site Task Force, was it allowed to consider reconfiguration of existing LASD properties? ANSWER: NO their mandate was to assume the 10th site went forward and to consider who should be there. 52:15 You seem to say “When a school is working well, don’t disrupt it.” Do you agree the same logic applies to BCS? 01:00 David Jacques. I challenge the idea that there will be a significant number of occupants with kids in the new NEC developments. 03:20 Ann Waterman Roy. I appreciate that you need to balance needs. However, I wonder if there really is such extensive enrollment growth than it can’t be handled with existing capacity. 04:50 A. W. Roy. When you consider BCS needs for the short and long term, please make it a dialogue. Don’t just ask us for a list and throw it over the wall for you to process it, and then you throw it over the wall back at us. 06:10 Andrea Eyring. 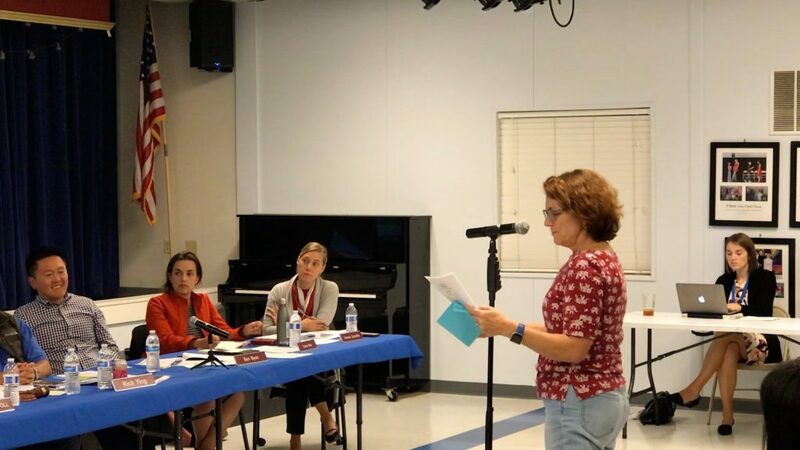 I was on the Bullis Purissima PTA board the year it closes and on the Covington PTA board the year it opened. We agreed to the split the into two sites to achieve the 5-year agreement. It has been hard on teachers to shoulder the intercampus commuting. Right now my kids are grown. I am not commenting from a parent POV. 08:08 A Eyring. 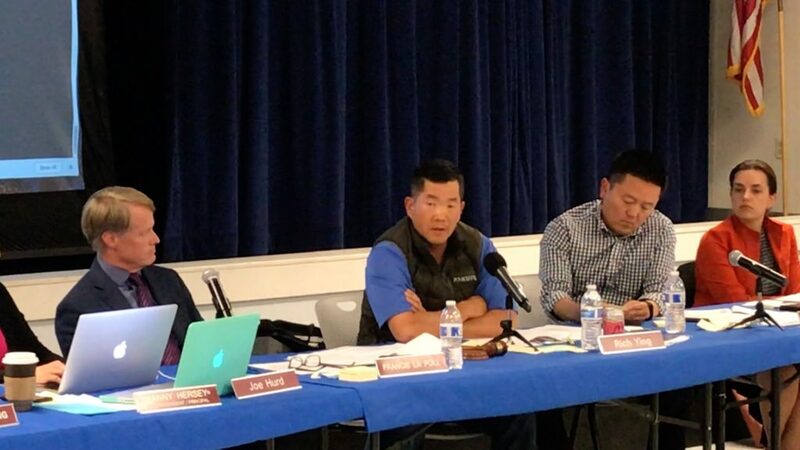 The Hillview Middle School in Menlo Park is a bad example. It is 100% a junior high and is able to share more of its spaces. A k-8 need specialized spaces. 08:30 A Eyring. When we made the 5-year agreement four years ago, both parties made enrollment projections. LASD is 500 below its projection. BCS is right on, or a few over its projection of 900. Andrea Eyring explains that the Egan camp has been a school “home” to many students who completed the whole 8 years there. BCS students and families don’t like being “disrupted’ more than LASD students and families. She said the LASD trustees are not truthtellers when they say Measure N was passed for long-term flexibility. She said it was sold to voters as voters as a fix to current problems. 09:55 If you need a neighborhood school for NEC why is there any conversation about putting BCS at Kohls 10th site. BCS draws from the whole LASD community, across all the attendance areas. 11:10 Rich Ying. Some alternatives have not been vetted. The devil is in the details. 11:40 There is the TDR risk. There is the counterparty risk – if the city of MV places conditions on the $23 million park funds, and you are not operating the site, then you are relying on a 3rd party to fulfill that City of MV condition. 13:55 If you buy the Kohls 10th site and only after that you scope the building plan, you will risk a budget bust. 14:20 I echo David Jacques comments about low family formation There are rising construction costs for housing. It’s $6 a square foot now. That means at those high rents, there is not a lot of family formation here. I have talked to the developments at Carmel, Greystar, and Promethesus – the developers who are putting housing in NEC right now. Those are all 1 or 2 bedroom. They don’t build 3’s because they don’t pencil out. 16:50 Rich Ying: You really should do a conceptual building budget before you buy the land. 17:25 Next member: I agree with Vladamir the focus should be on the kids. The questions just create more questions. We should work together. 18:55 Ms. Rao: So you ask are we interested in occupying the Kohls 10th site or not? There are so many unknowns. How many kids can be accommodated there at the 10th site? What will the CEQA say [especially about traffic]? What is the Plan B? What is the Budget? What is the estimated cost? 20:40 Dr. Suttcliffe. How can you do such a large deal without knowing how many kids can be there, with how much space, and who those kids are? Is this the best choice? Is it a possibility that BCS can be on this site? But don’t we think the NEC Community is being mislead and that they will be upset if they are anticipating an NEC neighborhood school ? 22:35 Traffic. BCS traffic at the Kohls 10th site will be worse than NEC neighborhood school traffic. 900 BCSers will be traveling one way while NEC ers travel the other way. What congestion! 23:40 Joe Hurd Thank you for spending time with us. I look forward to more information. Let’s do what is best for all of the students of LASD. 24:35 Francis La Poll makes closing remarks.